1041 E 113th Street Crown Point, IN. | MLS# 438808 | Welcome Evers Realty Group, your number one source on the web for NW Indiana Homes for Sale, Chicago South Suburban Homes and Indiana & Illinois Real Estate. 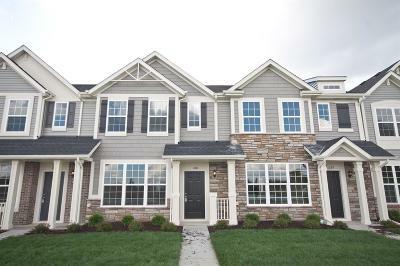 Ready to move in NOW is the Energy Saving Turnberry Townhome, w/a HERS rating of 73, located in the beautiful community of Hamilton Square, across from a large pond. This spacious, move-in ready 3 bdrm, 1 3/4 baths, features a large great rm & eat-in kit w/ plenty of cabinet space! The kit features 42' white maple cabinets, HD laminate countertops, quick step flooring, & stainless steel appliances. The main floor also features a large bdrm. Stunning oak railing w/wrought iron spindles lead you to the second flr. Upstairs, is a large master bdrm w/a spacious walk-in closet, an additional large bdrm, & full bathroom. Through your mudroom/laundry room & across your private outdoor courtyard is a 2-car garage. Energy features include a 92% energy efficient furnace, Low E Energy Star qualified windows, California corners, Tyvek exterior house wrap, & a 3rd party inspection. The home comes with a 10 yr structural warranty & consists of an industry-best customer care program.